Here is the third entry for the Chococolate Baroque Challenge #34, the dragons card in the middle. Here they are. Maybe I should call this set Og3ne as I finished the last one watching the Eurovision Song contest! The idea was formed – I had an underwater card, an “on the ground” card so the next card would be off the ground. Not necessarily in the “air” – in space, another dimension… A dragon and his treasure. Dragons with glittery bellies from sliding across the treasure, geometric and clean shapes like sparkling gems. All stamps used are Chocolate Baroque sets, I’ll list the names of them later. The layout. This way? Then there’d be a very empty spot on the top right, wouldn’t be balanced. It lacked something so I asked on facebook for advice. I figured castles in the background would be very suitable. This seemed good – the red winged dragon near the red jewel, the teal dragon neer the teal jewel. The card was just too big and I wanted the line of sight to be correct, so I cut off the bottom bit, trimmed the card a bit and inked the edges. I added some text. (I had allready glued down the dragons with foam dots… not the smartest order but I had find the perfect spots for them.. The tail of the teal dragon is glued onto the card without foamdots, so it won’t in the lin of sight of the two dragons’stare. Yup a small mistake, shouldn’t have tried covering it up I suppose. Here they are. Maybe I should call this set Og3ne as I finished the last one watchint the Eurovision Song contest! I just love the drops on these plants, Vrouwenmantel. I enjoyed making the previous card and loved the outcome so much, that I wanted to repeat the recipy: choose which one of the four colours will be the accent color, and choosing 1 or 2 as main background colours. The other colour is used for colouring. 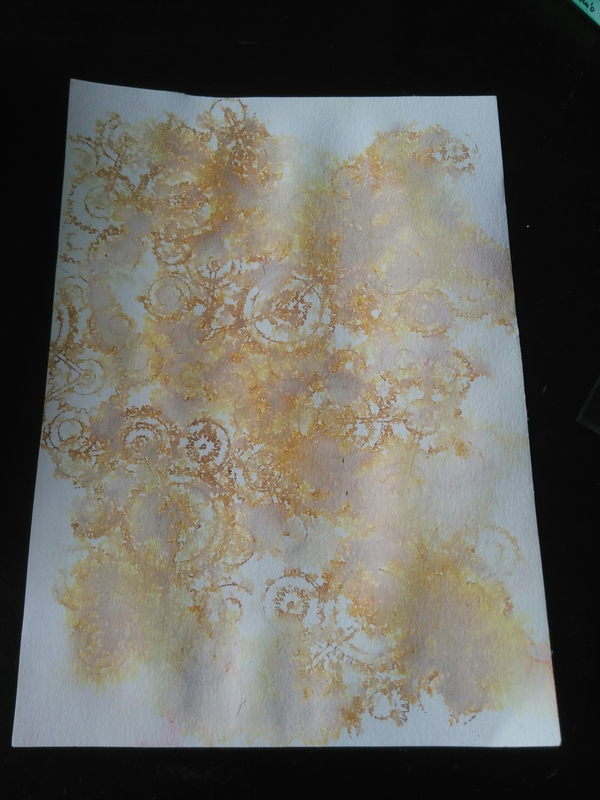 The colours I used were the ones from the Chocolate Baroque challenge 34. (Do you know that now it doesn’t look like cracked pistachio but more like peacock feathers? It really looked like cracked pistachio on my phone… ah well, at least I’ve been consequent). Only colours used: Distress oxides cracked pistachio, barn door, fossilized amber and vintage photo. Also used: Stazon valentine red and pupmkin, glossy accents, spectrium noir sparkle pen, distress stickles. 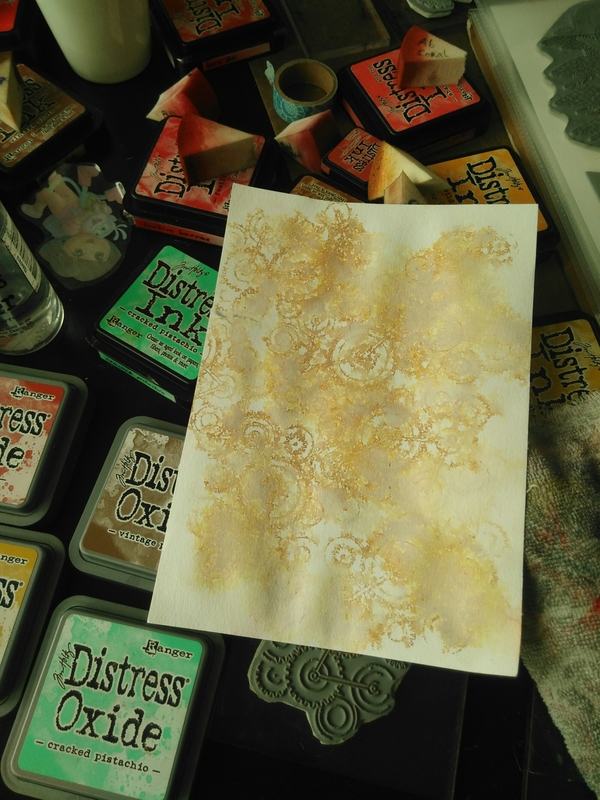 Also used the distress markers (same colours) – the cracked pistachio was a lot darker from the markers! Used it for the cut out plants. Previous card was a bird, but with and earthen feeling to it. This time I wanted the sea. I made some error along the way ofcourse, makes it all the more challenging ;). Repeat stamping the waves Harlequin Fragments. I should have changed the pattern a bit more, stamping like the top row. Didn’t wait for it to dry this time, I helpd a hand. Adding more colour – the card was still to white. 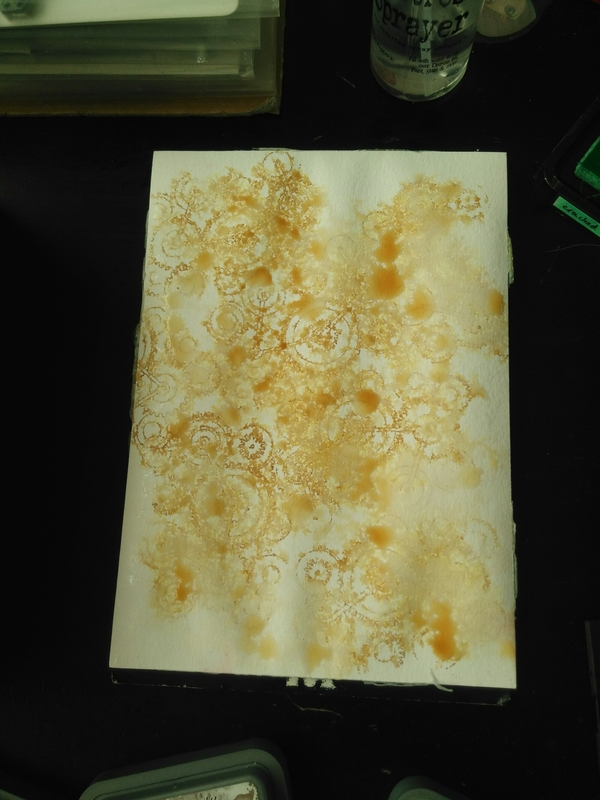 I inked up an acryllic pad with oxide ink and sprayed it with water, then held it over the paper and let the water run off the block onto the paper. I caught the excess water again with the acryllic block. Next I stamped this stamp also from Harlequin Fragments. Only remembering afterwards that I should have stamped the mermaid first. The mermaid from Mermaid Queen is stamped, but not straight and her fin was showing in front of the “coral” – for depth effect this is not possible. Tried covering up the tail with a stamp from Texture Fragments, but it turned out too heavy. But still wasn’t satisfied so I figured there should be something in front of it. So I stamped these seaplants from Seadragon and Mermaid Queen and fussy cut them out. My daughter of 4 is also making cards. Spectrum Noir clear sparkle pen on the mermaids body and tail and bubbles. (Her skin is shiny too, bit fishlike). The pair together. The cards are A5 size, whereas usually I make A6 size. But loved making them this size! OH also added a seashell from one of the sea sets and hidden behind a plant is a little seahorse. As many crafter knows – taking pictures is difficult. The shinyness of her skin – i just couldn’t get it on the picture. also the colours in the picture seem different (on screen) from real life. Crystal stickles and glossy accents on the bubbles in her hair. Her eyes have the only black on the card. (I’m even wondering if it was black and not just walnut stain). Viva las VegasStamps, Cogs embossing folder from Tim Holtz. Not sure how I made it… looks like I embossed the paper, coloured it with inks (or couloured the embossing folder) then flattened the middle piece again by making a small rectangular stack. The edge is done with crayons and distress inks. A ghost image of the soldier and the dancing lady in the frame. The question is, who is thinking of who? The soldier, masculine, “business” (as in, war, violence) or the dancer (love(r), emotion, pure). Is he in her mind of is she in his? Are they truely seperated in distance or are they separated in class? The soldier, following the laws and rules without question vs the gypsy, free thinking spirit. No matter what, they are longing for eachother. Nothing to do with the cards, but the fact that time keeps moving relentlessly. Seem every autumn I’m spending more energy then I have – how I wished I could just take time off work from the 1st of October untill the end of january. Sort of a wintersleep. Alas, in modern day society taking such a time off is hardly possible. Not working is hardly possible – we could manage but would have to flip every coin twice. Don’t look forward to that, so I’ll just keep going on. Eventhough I haven’t blogged, it doesn’t mean I haven’t created. It just meant I spent what little time I had on creating tangible things instead of some bits and bytes. …is what the subjects of the next cards seem to have in common. Dragons, knights, godesses, pure and brave hearts. The first card, the dragon and t he knight, is an old one. I made it 3 years ago and had kept it as it wasn’t finished at that time. I finally framed it. The cards are lying under a glass plate, to flatten them out a bit more. I still have to take better pictures of all these cards and show them better, but there is one I’d like to show a bit more in this post as I’ve given it to someone allready. And that is the stamp Pearl Gazing, by a design from Renee Biertempfel, produced by Sweet Pea Stamps (now retired). It’s the bottom middle card. I have tried to copy the exact artwork there, I often do that the first time I use a stamp to get a feel of how to colour it. I didn’t take daylight pictures and then it was time to leave to the party… so just a quick picture. It was a double birthday, for a mother and daughter. 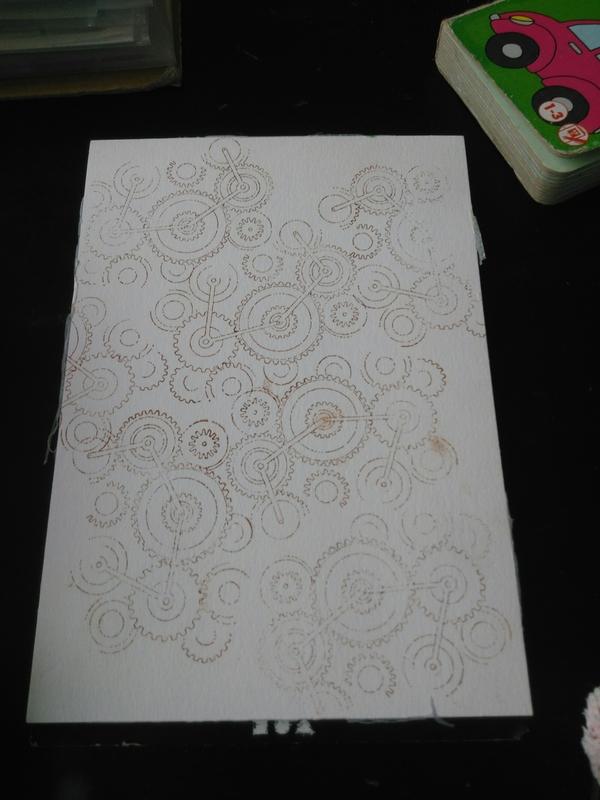 This is a Santoro Mirabelle stamp. And last another zoomed in image of Pearl Gazing, as I really like how it turned out. Too bad I didn’t get a better picture of it, I guess I’ll have to remake it ;). Or rather twenties. I’m not good with years. I only got a feeling of old times when we got this wedding invitation. Bronze distress stickles as glittery accents and that pearl powder from ranger. Bronze coloured as well. Quite pleased with the result, it matched their invitation quite well (while not knowing the exact timeframe of their invitation). It’s been quiet here, but luckily I occasionally find some time to craft. Here are a few cards again. The first few were made from a big background I had made maybe a year ago (See Goodbye Lullabye part 1 and part 2). As the colours are very bright it just laid there, me not knowing what to do with it. Adding another colour would not fit. 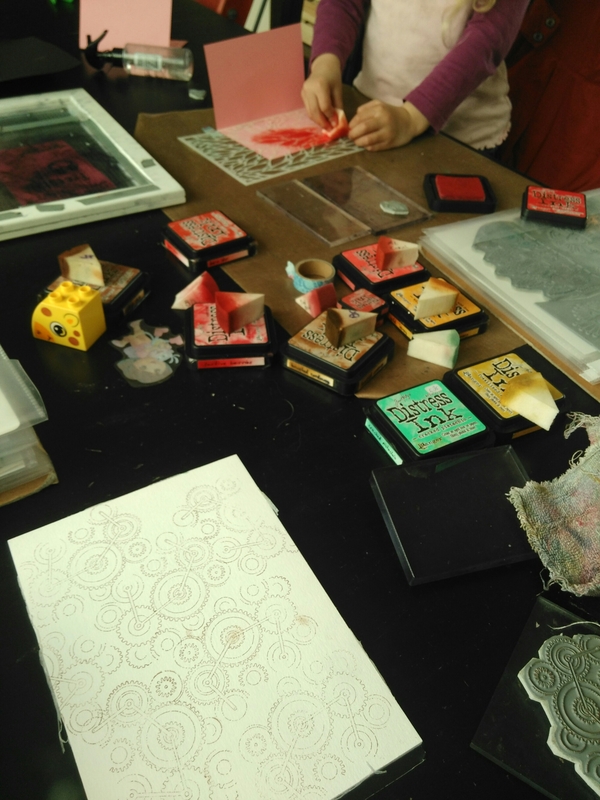 Then I got some Banksy stamps from Vivalasvegastamps, and some Art Journey stamps – both are stenciled style stamps, very suitable for stamping in one colour. Background made with TCW cell theory 12×12 stencil. Text is from Indigo Blu and the painter is from Banksy via VivaLasVegaStamps. The card isn’t rectangular, the lower right corner is 90 degrees, but the upper left is bigger. I felt that fit the sentiment better then a straight card. 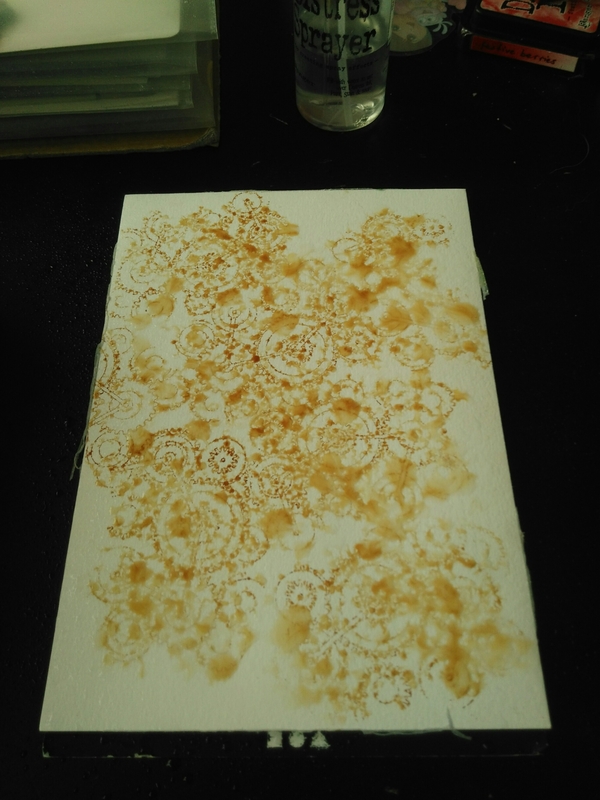 Same background stencil (TCW cell theory 12×12). Droplet branches and girl with umbrella are from Art Journey. The text is probably from De-Stempelwinkel, I love this poetry /proza kind of text. Lets imagination roam freely. Oh this one isn’t finished yet. What I did here so far is add a layer of modelling paste through a TCW stencil. I stamped the Banksy girl onto regular tissue paper, carefully removed the upper layer of the tissue paper so there is only one layer left and then used decoupage glue on the card and carefully laid down the tissue on top of it and smoothed it out. It tears easily so be very carefull and accept a few folds here and there. To make the edges of the tissue paper less obvious, don’t use scissors to cut out the image but tear it out, the ragged edges blend better. I’m back in a bit with more cards!